Ankara, April 1: President Recep Tayyip Erdogan's Justice and Development Party (AKP), spearheading the Islamist agenda, has scored a victory in the local elections in all parts of Turkey, barring the three main cities - Ankara, Istanbul and Izmir - which hold the nerve centre of national politics. The biggest jolt to AKP came in Ankara, the Turkish capital where Erdogan's party has held onto power since the last 25 years. According to the state-run Anadolu news agency, the prime opposition People's Republican Party (CHP) has won more than 50 per cent ovtes in Ankara. Turkey's Erdogan Stokes the Hagia Sophia Museum Controversy, Says will Convert it Back to a Mosque. The AKP is trailing at 47.6 per cent votes, the report quoting a Turkey Supreme Election Council official said. With this result, the next Mayor of the capital would be from the secual CHP party. Apart from Ankara, the Opposition alliance has scored a decisive victory in the coastal town of Izmir as well, winning more than half the votes polled. The AKP, meanwhile, trailed with around 30 per cent of the electoral share. 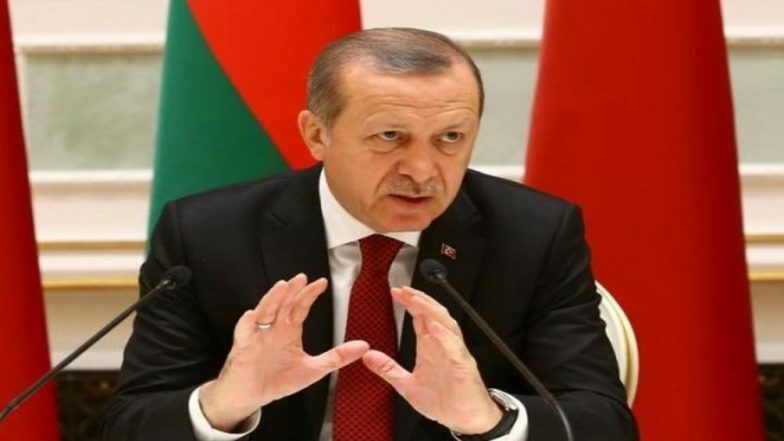 In Istanbul, however, the AKP could not be ruled out yet, said the Election Council official. As per the official figures, Erdogan's party has secured 48.51 per cent of the votes -- marginally lower than 48.79 per cent polled by the CHP. The counting of 84 ballots is yet to be conducted as both parties had raised objections. AKP's Istanbul mayoral candidate Binali Yildirim said he would ultimately emerged as the winner as nearly 3,00,000 votes received by his CHP rival are "invalid". The margin of difference between them is less than 25,000. Overall, the Erdogan's party, in alliance with the Nationalist Movement Party (MHP), won over 51.63 per cent of the overall vote. The Opposition alliance headed by CHP has secured 37.55 per cent of the nationwide vote share.